We have endeavored to scan the entire magazine collections of SportsCar Magazine and On The Grid/Today's Motor Sport Magazine. These magazines are scanned from cover to cover in a high resolution (300 dpi), color PDF format. Everything is copied to a mid-sized USB flashdrive (PC and MAC compatible) and mailed USPS Priority Mail, unless otherwise purchased. The fact that these are entire sets, digitized and searchable, is very desirable and coveted. Available only for a limited time - get yours NOW! 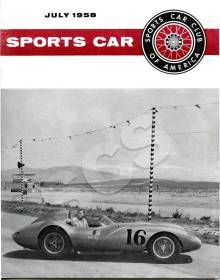 Every issue of SportsCar Magazine from 1944 through 1970 is available and organized by year and month. The entire archive is available for purchase for $375 USD. Or you may purchase individual archives by year. Available for a limited time, get yours NOW! 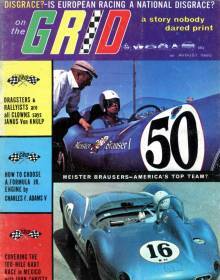 Every issue of On The Grid/Today's Motor Sport Magazine from June 1960 through January 1964 is available. The entire archive is available for purchase for $325 USD. Or you may purchase individual issues. Available for a limited time, get yours NOW!